Best 1/5 Scale RC Reviews: 5 Top-Rated Cars in April 2019! RC for the inexperienced means radio-control, a 1/5 is the scale of the model as compared to the original sized object. So, and RC 1/5 is a one fifth scaled down model of an original model. Radio controlled models are not remote controlled, a radio controller is a device that transmits powerful radio waves to a receiver in the vehicle. The remote control is a device that is connected by a cable to the vehicle. If you have decided to buy a radio-controlled car or RC, remember that they can be expensive, and in this article, I will present you with five expensive radio-controlled vehicles that are 1/5th the size of the original version. 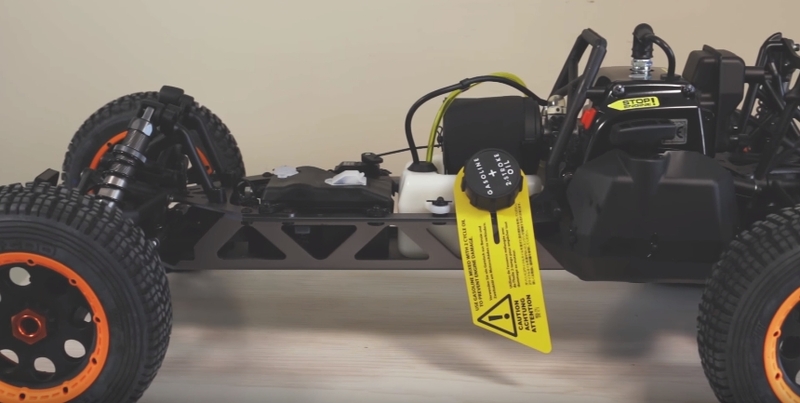 In this review I present you with the five best off-road nitro powered RC cars, and just so you understand the difference, here is a breakdown of the three basic elements of a good RC car. This should be powered by a 9V battery and must be rigid, rugged and provide enough control for your vehicle. This is set in the vehicle and must be powerful enough to receive the signals even without an antenna. The cheaper models don’t work when the antenna is broken. This can either be nitro (gas) powered or electric. With the current advances in EV, the difference between the two is starting to get hazy. However, most gas-powered motors do provide more power and are longer lasting than their electric contemporaries. Also, gas-powered cars are more expensive to buy. The Team Losi® K&N 1/5-Scale Desert Buggy XL™ is an all-powerful gas powered buggy that uses a23cc gasoline engine set in an all metal frame. The tank provides up to 40 minutes of continuous use. When it comes to sublime attraction, it’s hard to find something to beat the Losi® 1/5-Scale K&N Desert Buggy XL™. 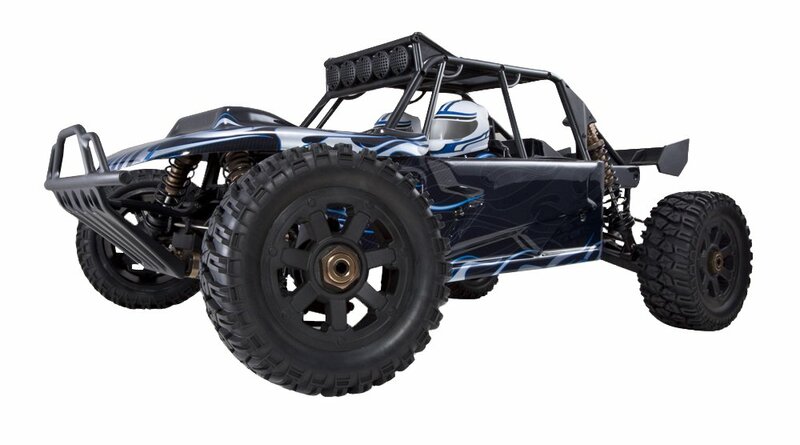 This is an unstoppable 1/5-Scale desert buggy that delivers near-perfect performance over the toughest of terrains. Lest start with the fact that this is a Losi®, which already makes it stand out. Based on production excellence, every component of the 1/5 model is absolutely spot on. The outside body is an officially licensed K&N construct with a genuine K&N air filter inside. When you look closer at this model, you will find a 4mm aluminum chassis with 4 ¾” wheels that give you a 3.1” ground clearance. This model comes with an injection molded roll cage, and a 4WD drivetrain powered with a 23cc gasoline and 740cc Fuel Tank Capacity. The servos are 30Kgs, and the radio package is a Spektrum DX2E 2-channel powered by a Dynamite 1700 mAh receiver pack. This is a high-grade off-road buggy that comes with an expensive price tag that meets the brief. In other words, you pay for what you get, and in this case, you get a high-performance gasoline RC that is near to divine perfection you can get. This is the Team Losi® Black Monster Truck XL RTR, AVC: 1/5 4WD,and is another fine example of true quality and performance, delivering an over 30MPH result. When it comes to performance and true monster performance at that, you will find it hard to beat this Losi® monster truck. It’s in a league all of its own. Let’s start out with the fact that this is a 36″ long and 26” wide vehicle. 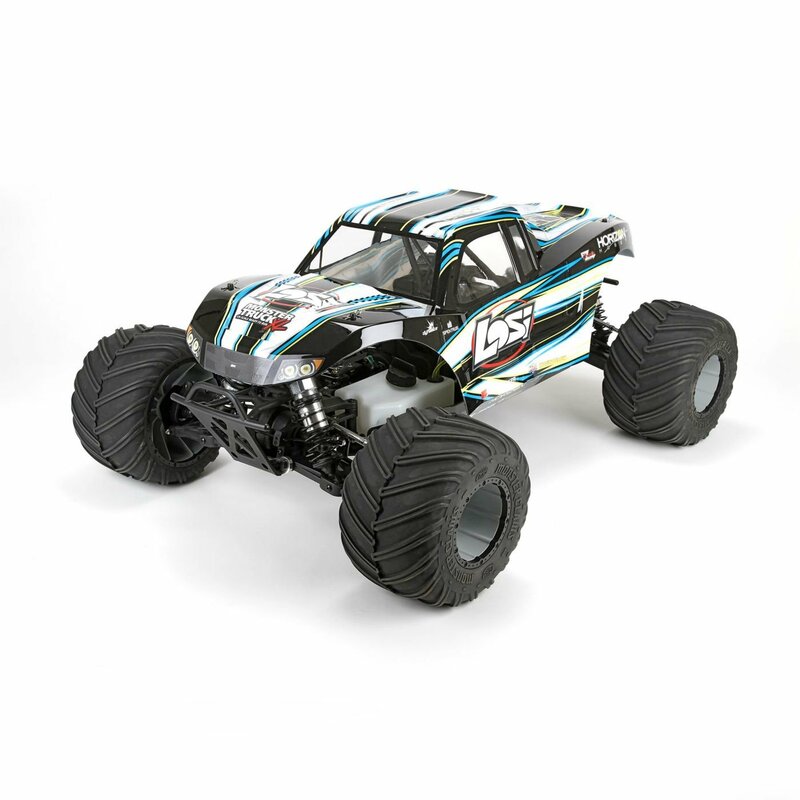 This Losi® Monster Truck XLis an exact 1/5-scale replica of the off-road offender and its designed to reach speeds in excess of 30mph. To reach this level of performance, the Losi® is powered by a Dynamite® 29cc CY F29 4-bolt Gas 2-Stroke engine with a 740cc fuel tank and uses the Losi®Desert Buggy XL™ 4WD system. These combinations deliver the basics for performance, but what makes this beast stand out on its own is the integration of the patented Active Vehicle Control AVC® Technology. There are two large-scale steering servos firmly integrated with aluminum front spindles, heavy-duty monster truck tires, and extreme torque differentials. Controlling this monster is the Spektrum™ DX2E transmitter that is powered by a 7.4V 4000 mAh 2S 15C Lipo Receiver Pack. The tires are Losi Monster Claws. Did I mention that you pay for what you get, and in this instance, you have gone one further than the other Losi models, you have taken a monster step into the world of racing nirvana and the halls of RC Utopia? 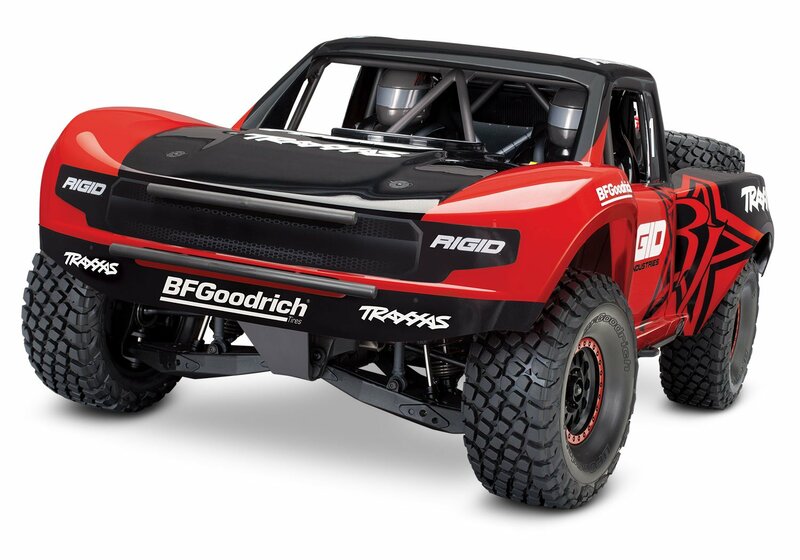 The Traxxas Unlimited Desert Racer is a PRO-SCALE™ performance model that delivers the exceptional electric performance of over 50mph! It doesn’t get much more real than this super fast model. Traveling at speeds of over 50 mph, you can take on any competition with a winning advantage. 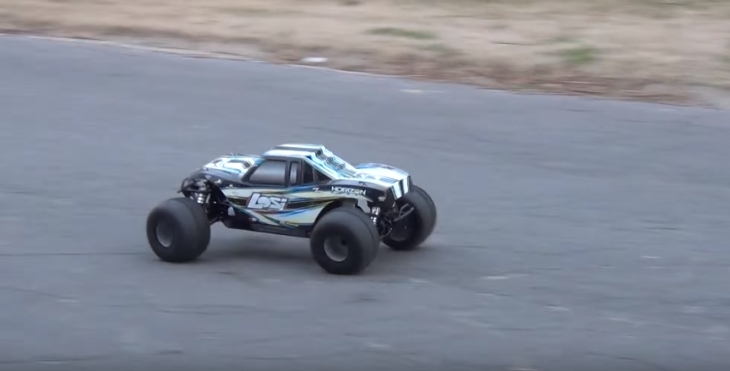 This is an electric motor RC that comes with a 4-wheel drive desert race truck chassis. The design includes a 4-link solid rear axle and is a feat of engineering excellence that starts from the cantilever sway bars and goes all the way to the 8 GTR shocks. You get a VXL-6s speed control with the power of a 2200kV brushless motor. This motor is connected to BFGoodrich® Tires and Wheels delivering maximum grip for seamless transfer of torque and power. Let’s take a closer look at what you get here. This is a Pro-Scale™ Body built with a Rugged Tube Cage and covered with Realistic Side Plates and a Detailed Interior. There is an Inverted Tub Chassis and Protective Skid Plates. The Versatile Battery Compartment comes with Fixed Battery Connectors and is secured in a Fixed One-Piece Body. For added performance safety you get Reinforced Bumpers, and performance upgrades with the Dual Bellcrank Steering, Solid Rear Axle, and the Heavy-Duty Front CV driveshafts. When it comes to balancing power, you get Torque-Biasing Center Drive, Steel Ring, and Pinion Gears and eight long-travel aluminum GTR shocks; four with springs and adjustable ride height collars combined with the Heavy-Duty Front Suspension and Extreme Suspension Travel. The Realistic Sway Bars and Suspension Limiter Straps are all part of this amazing real to life experience. The power drive is the New VXL-6s™ ESC with Telemetry 2200kV Brushless Motor that comes with a Waterproof Metal Gear Servo and is controlled by the TQi™ Radio System. This is a more friendly budgeted item but is still amply priced which reflects the high quality and end results you get from this phenomenal RC. There is no doubt in my mind that this is the one to beat. 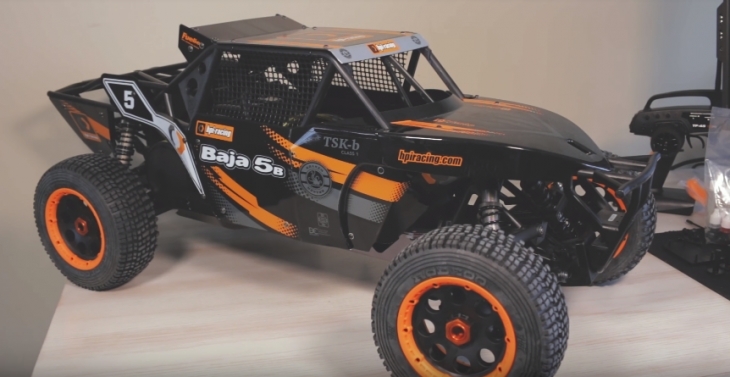 This is the Kraken RC and HPI partnership that gives you the Baja Kraken TSK-B Class 1 gas racer. The Baja Kraken TSK-B Class 1 is a classic tracing buggy designed for gas run races that want speed and durability in the most intense and crazy of circuits. 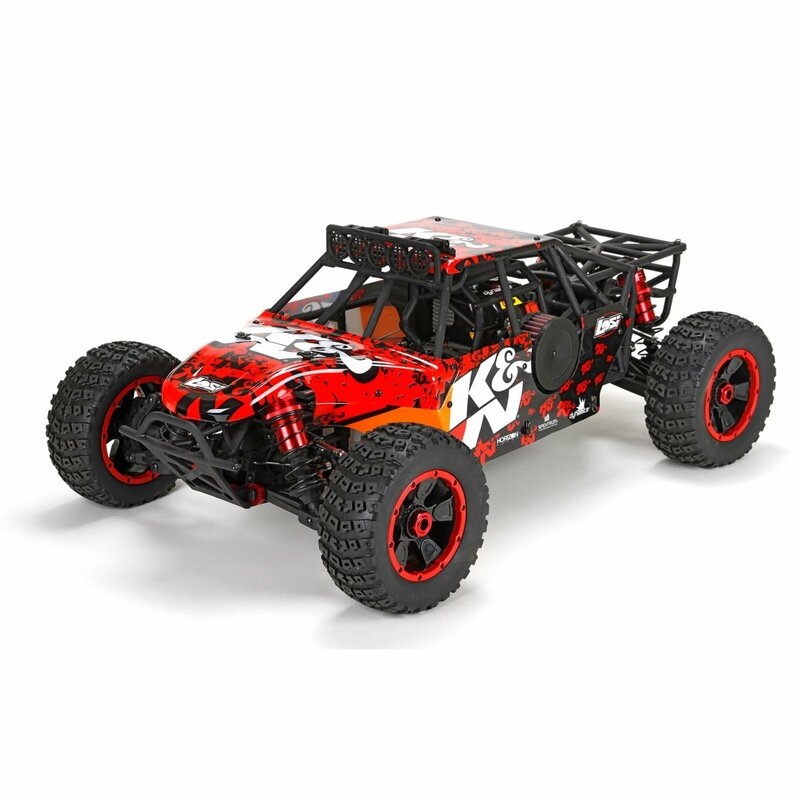 This model comes with an all polymer Kraken roll cage and holds a larger capacity and powerful HPI Fuelie 26S engine. This combination comes together with HPI heavy-duty suspension and drivetrain parts including their 24mm Heavy-Duty front hex hubs, the Super HD Driveshafts, and the One-Piece Rear Hub. The radio system is an all improved 3-channel TF-45 2.4GHz model that delivers Frequency-Hopping Spread Spectrum (FHSS) digital 2.4GHz radio technology. It also comes with some end-point adjustments and electronic failsafe protection you get more accurate control. The Baja 5B TSk-b Class 1 comes with monocoque 6061 aluminum chassis, that holds the powerful 26cc 2-Stroke Engine. This engine comes with their High Flow Muffler and 8000 RPM clutch. The 700cc fuel tank gives you 30 minutes of continuous driving, and the model includes Long-Stroke VVC/HD Racing Shock dampers, extra thick and oil-filled, externally adjustable coil-over shocks. The tires are Off-Road Beadlock that comes with a versatile staggered square pin design that provides extra secure gripping capabilities over all terrain surfaces and conditions. You also get their Extra-Strong Suspension Parts with Front and Rear Protective Skid Plates, so you survive all crashes and damage from extreme environments. The engine comes with a powerful Powerful Vented Disk Brake that reacts instantaneously, and you also get a Protective CVD Boot covering and protecting the driveshaft. The bottom line is that this is one rugged, heavy duty beast that will destroy your competition, as well as race them. The price might be high, this is the most expensive model in my review, but this RC is worth every dime. If its high grade, and jealous looks you seek, then this is the beastie to best everyone with. The Rampage Chimera EP PRO is an off-road rail buggy powered by a 150A electronic speed controller, 980Kv brushless motor, and dual 11.1v LIPO battery pack. The Rampage Chimera EP PRO comes with a 4mm T6 aluminum chassis, scale off-road tires, aluminum bodied oil filled shocks, and fully adjustable suspension. The wheelbase is 50cm, and the drive system is 4WD. This model is powered by a single speed 980KV RC4485 Brushless Motor and controlled by a 2.4GHz radio with waterproof electronics. This is a medium to low range model, it’s not as impressive as its (double cost) competitors here, and the performance does not meet their standards, but this is here because it’s a perfect beginners model. 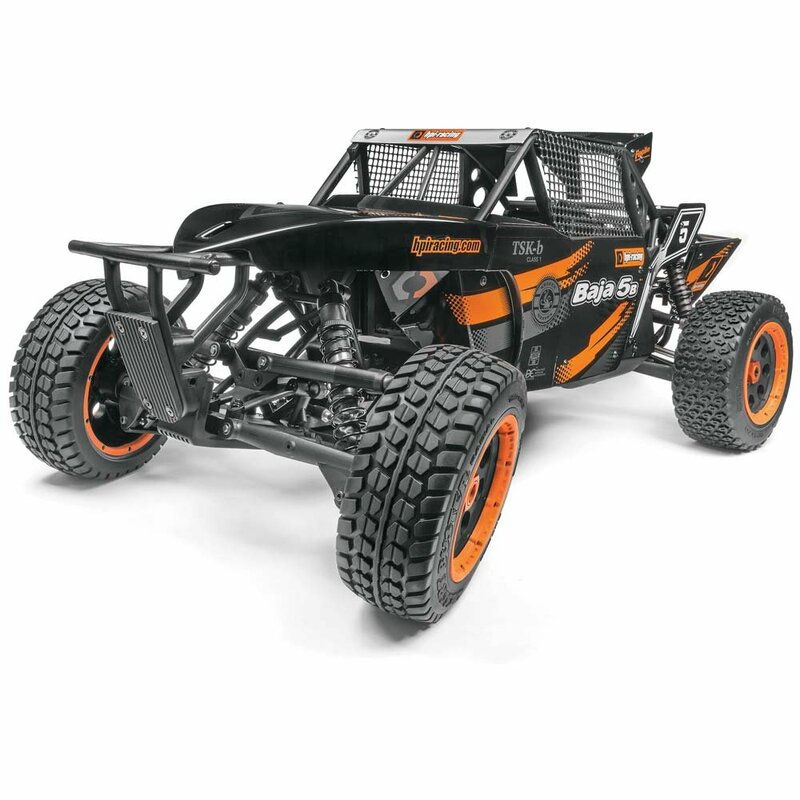 If you want to start learning the ropes of RC racing and don’t want to spend four-figure prices, then start with this model, learn the ways and wiles and then move onto one of the more powerful models.